I have a bunch of hazelnuts (filberts!) to use and I really wanted to make some kind of sweet cookie type of dish with them. I saw a recipe for Maple biscotti in a Moosewood cookbook and I thought I would take a clue from them to create this really yummy fall flavored biscotti. They are perfect for dunking into coffee, tea or hot chocolate. Or for just eating while running out the door in the morning. 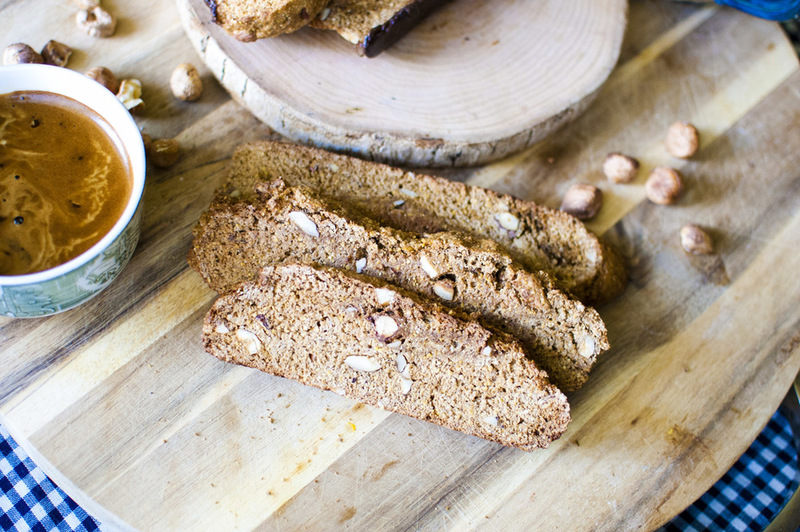 Making biscotti without oil, added fat or eggs was sort of a challenge at first! I think i've finally got these right though. You'll have to make sure the get crisped up at the end but once they are nice and dry they will last for weeks (if you can keep your hands off!) That makes them a GREAT gift for holidays, parties or housewarmings. Bring it with some yummy coffee or hot chocolate mix and everyone will love you. You can use whatever nut you want. Just make sure they are toasted. And use GOOD real maple syrup - you won't be regretting it! I dipped some in chocolate and those are lovely as well. I like them both ways, really. But hazelnuts really REALLY love chocolate. REALLY LOVE CHOCOLATE. And so do I.
Preheat your oven to 350 degrees. Line a large baking sheet with parchment paper. Mix the ground flax and 2/3 cup water in a small bowl and set aside. In a large bowl sift together the flour, cornmeal, baking powder, salt, cinnamon and nutmeg. Add in the flax mixture, maple syrup, molasses, vanilla and hazelnuts. Mix to combine but try not to overmix. Pace the dough on the cookie sheet in a log shape that is about 12-14" long and 4-5" wide. You want to flatten it just a bit but it will spread out some while cooking. Bake for 30 minutes or until the top is firm to the touch. Take it out and let it cool for 10 minutes. Once cooled slice the cook with a serrated knife into 1/2" slices. You can cut it at a severe angle (on the bias) so that you get longer angled biscotti or cut it straight across for short biscotti. Arrange the cookies on the baking sheet again and but back into the oven. Turn the oven down now to 300 degrees and bake for another 20-25 minutes, or until mostly dry. They will harden while they cool. Let them cool on a cooling rack. If you want to dip them in chocolate wait until they are cooled to room temperature. Heat up your chocolate until melted (either on a double boiler or in the microwave.) Dip them and set them on parchment paper or wax paper to let the chocolate set. Once completely cooled you can bag them up and store them for at least a week or maybe two if you don't eat them all before that! (They will soften up if you have a humid kitchen like mine and you forget to bag them properly!) Serve with coffee, tea, hot chocolate or just a nice tall glass of almond milk.